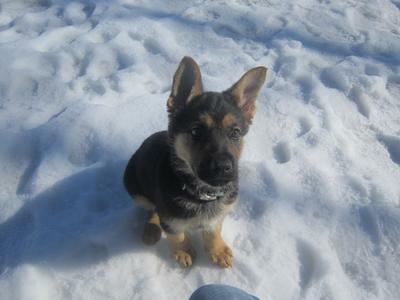 Jenny and I have been waiting, looking, and researching for a German Shepherd for about a year now. It finally paid off, when we found Baron a couple of weeks ago. He is very smart, and loving. We are looking forward to many years with this little guy. That's wonderful too that his ears are up so young but don't be surprised if they fall later on though. That's absolutely normal. I wish you nothing but the best with him. Make sure you get him all his shots and wormings and then socialize, socialize, socialize. And a puppy training class too is a great investment. Congratulations on your new puppy, Baron. Enjoy this puppy time, oh how I miss it, the bonding, teaching and training. By next year he will be big and strong. 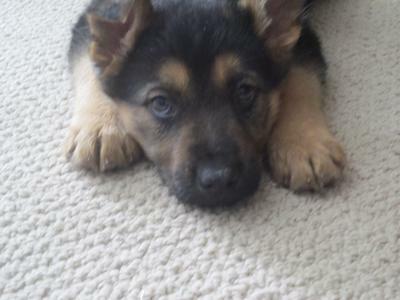 German Shepherds are truly an Amazing breed, they are so smart and protective. Take care of Baron and he will take care of you!